High up on the slopes of Ingleborough is an area of barren moorland known as the Allotment - and under the care of the Ingleborough estate. It is so remote that even Wainwright conceded to write: 'It is a fine walk to the Allotment and it is a fine walk from the Allotment - but the Allotment itself is a wilderness.' A nudist camp established up here would probably go unnoticed for months ...... yet it conceals, cunningly - one of the greatest potholes in England, the depths of which most of us can only imagine: Juniper Gulf. 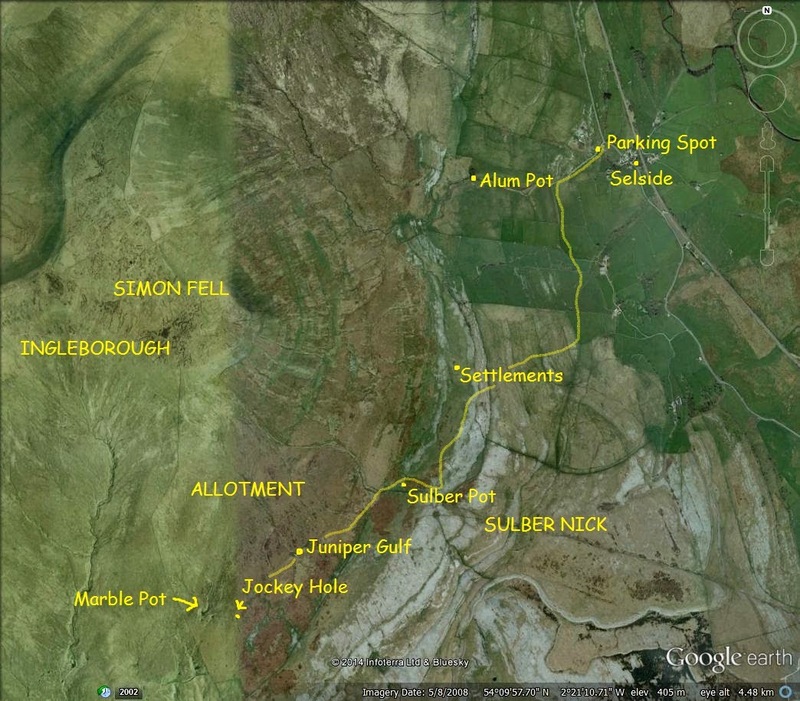 I always reach the Allotment from Selside in Ribblesdale - taking the path up towards the legendary Alum Pot, then striking south towards Sulber Nick - a natural fault in the limestone. This is one of my favourite strolls in limestone country: pavements, boulders, mountains, rough moorland - it has the lot. There's something for the camera around every corner. Road to paradise? At least for me - as I head south passing Gill Garth Farm. It is one of the best preserved Iron Age settlements on Ingleborough, with a large triangular enclosure surrounded by several smaller ones. At last we reach a junction with our way on to the west (behind the camera) - but it's worth pausing here to see the natural fault of Sulber Nick. You can see it here cutting through the scar and along down the moorland and its 'nick' has been utilised by the Three Peaks walk. Ancient tribesmen would have made their way up here, no doubt, on their way to the Ingleborough summit 'cemetery.' Sulber Nick is a fault formed by earth movements millions of years ago - and its actions caused several famous potholes to develop. The fault is so large that it cuts through the since glaciated valley of Ribblesdale and has formed potholes beneath Penyghent. Above the nick, Ingleborough's famous flat top looms in the background, menacingly - while Simon Fell - its satellite, takes centre stage. Limestone pavements, swept clean by the Ribblesdale Glacier, merely indicate the height that the ice was working at. It's amazing to think that everything here would have been under ice 13,000 years ago. Sulber Pot can be found by crossing a gap in the fence on the right - and is ignored or unsuspected by most who pass. At the bottom of the 15 metre drop is a large chamber. A permanent metal ladder has been rigged and is precariously held on by ropes at a near vertical angle. The danger is softened by a plethora of wild flowers. Every time I visit - I want to descend - but without a companion and a life-line, it's a 'no go'. Far better to live and take another picture: this time of Sulber Pot from the east, looking up to Simon Fell and the remains of a broken wall which once surrounded the pothole. The pavements surrounding the pot are some of the finest in the country. The famous boulder on the left dominating the immediate surroundings with the sleeping lion of Penyghent in the distance. We'll have a closer look on the way back. While Sulber Pot is impressive but doesn't lead very far - Nick Pot is more concealed by foliage which is perhaps just as well. Hidden inside here is one of the deepest underground shafts anywhere in Britain - a massive 250 foot drop in pitch darkness leading into the bowels of Ingleborough. We then leave the Three Peakers heading up or down the mountain, and turn off to the right, just beyond Nick Pot - where a ladder stile leads into the Allotment - an upland area of limestone covered by glacial till and peaty moorland. It looks the last place on earth anyone would want to walk ..... but there are many hidden secrets. The trick is to cross the ladder stile and then keep the perimeter wall of the Allotment on your left at all times. After a few minutes of trudging, a glance to the right will reveal the fenced hole of Little Juniper - a welcome oasis in a barren landscape. Now keeping Simon Fell in the line of sight - move a few yards west of little Juniper and the sound of falling water beckons. This is the key to Juniper Gulf - an absolute classic in every respect. Take great care when approaching the entrance. At first it looks like any other limestone pavement, but close inspection reveals a cunning series of holes dropping into darkness. The juniper itself is still there - adding a touch of beauty. Juniper Gulf has formed where the waters gathering off Simon Fell have converged to exploit a major joint in the limetone, origimally created by faulting. The fault can be seen clearly in this photograph. Heaven knows how many sheep must have met their end here. There is no fence - and in mist it must be a nightmare. There are reports of cavers coming out into thick mist and being lost in the barren sourroundings. The initial shaft is about 20 metres (60 feet) deep and can be photographed like this by wriggling forwards on the tummy. The waterfall is heard rather than seen - but Juniper Gulf's great secrets are revealed to fully equipped cavers only. It is what lies beneath that makes this pothole a legend. My daughter. Emily, at Juniper Gulf ten years ago. Like you do! A good view of the catchment of Juniper Gulf - with Simon Fell and Ingleborough collecting water on their upper Yoredale slopes before dispensing it towards this fault guided joint. You can see why underground chaos is the result. This pothole floods at an alarming rate after rain. Juniper Gulf from the south side. 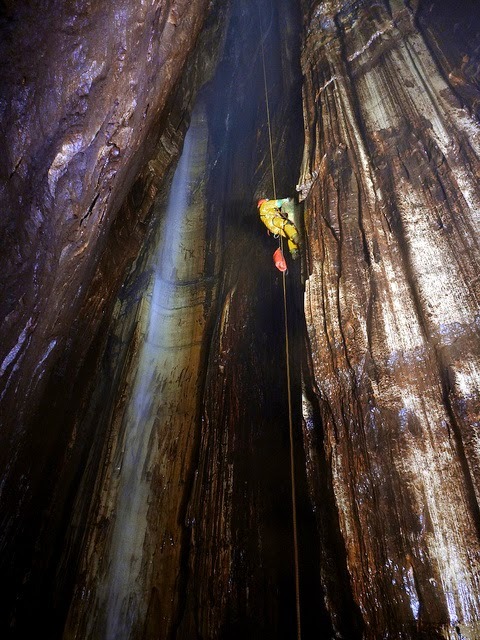 And for the majority of us - who can only imagine - this is the awe-inspiring challenge that Juniper Gulf presents to the cave explorer. The final 60 metre shaft has walls of beautifully fluted limestone with a range of colours glowing in the light. Rift Pot has a haunting beauty about it and shelters a host of rare, limestone loving plants. I love the place. Rift Pot and Simon Fell. Albert Mitchell, founder of the Craven Pothole Club, has vividly described how he asked to be lowered down here on an 'elasticated' rope as a young lad, and began bouncing up and down the shaft. The things you do when you are young! Rift Pot and Ingleborough - as ever. Rift Pot from the north. No pothole on the Allotment brings a shudder quite like Jockey Hole. This shockingly exposed chasm lies in the bottom of a funnel-shaped doline quite close to Rift Pot and is easily identified by the massive detached block of limestone to one side. With extreme care, the explorer can step gingerly onto the boulder - 'mounting the horse's back', if you like - and peer down a narrow shaft that drops sheer for 67 metres (200 feet). The author - as a young lad - doing just that. Daft so and so. Jockey Hole has always fascinated me. Couches of heather do try to give some beauty to Jockey Hole - but it is perhaps best left as a place experienced by few. I'd been made 'pothole weary' by the end of the afternoon and longed to walk in a place where I didn't have to watch every step: so I retraced my steps along the Allotment wall back to Sulber Nick - and those enigmatic boulders we glimpsed earlier. Dropped by the Ribblesdale Glacier - and since rounded by water action into a lovely specimen for the camera. This is perhaps as fabulous a piece of limestone country as you can find anywhere. These two fellas have been sitting here a long time, arguing with the other boulder that they are more impressive - and with their floral display of reds and greens, who can blame them? Go and check out this remote stretch of limestone country for yourselves. Great to show Juniper Gulf Stephen, an old favourite of mine and one which I have bottomed a couple of times. The big pitch isn't really as scary as it seems..but still needs to be cautious. Great post! Many thanks! Juniper Gulf is a pothole I've never been down but I've always loved the place: I doubt with my knees now that I could tackle such a challenging pot. I envy you for going down there. These days I stick to Long Kin East nearby. Glad you enjoyed the post. Well captured images of the area. Nick pot has seen us off, but many trips to Juniper, Rift etc. I can smell the moorland from your pictures. Great post! Loved your pics of all the limestone scenery. I've walked that area before, but you mentioned some features I didn't know about; I must look out for them next time. I'm a writer and I love using Yorkshire settings in my stories. The landscape is so rich, I could write forever and not exhaust it.